The following list are items that are needed to get you started making home sourdough bread. Accuracy is important in making top quality artisan bread. There are three types of kitchen scales; mechanical, balance and digital. Digital scales are often inexpensive and have the advantage of being able to set the display back to zero when needed. 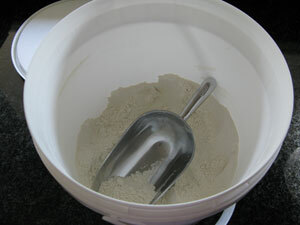 Once the dough is mixed you need a fairly large container to hold the dough with plenty of room for the dough to rise. 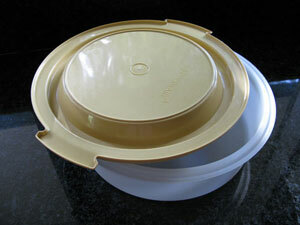 Below is an old cake container that is perfect for the job, however any large plastic container with a lid will do. You can use unglazed quarry tiles, a pizza stone or even that bit of left over granite from a kitchen renovation. 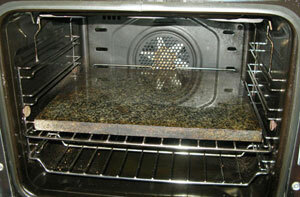 Place the stone in the oven an hour before baking and turn the temperature to maximum for your oven. Bread needs a steady heat and the stone helps achieve this. Place a small stainless steel dish/bowl in the oven during preheating. This will hold the boiling water just before the bread dough goes in. 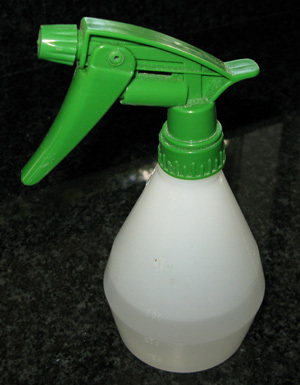 A tip is to put metal chain links or clean heavy nuts and bolts into the container which will increase thermal mass so that when the boiling water hits the links a large amount of steam is created. Steam in the first few minutes of the baking will create a beautiful crust. If using a glass or ceramic dish ensure that you put it in the oven at the same time that you add the water to it. If you have it in the oven heating up from the start then adding water to it (even boiling water) will cause it to crack or shatter – believe me as it’s happened to me. Spray the sides of the oven when you put the bread in to create steam. Steam in the first half of the baking cycle will create a beautiful crust. Remember to place the bread in the middle of the oven. Additionally you can lightly spray the loaf when initially inserted into the oven for a nice glazed look and a tender crust. A basket is where you place the bread to rise. They may be made out of wicker, silicone or plastic. 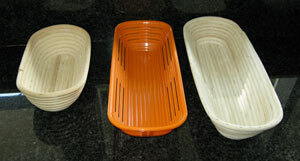 It should be lined with a tea towel or linen cloth before placing the moulded bread into it. Linen are the best but otherwise cotton varieties that have a simple weave are best, this lessens the chance that they will stick to the dough. 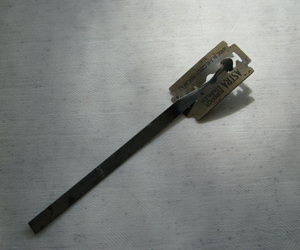 When working with the dough on the bench or to scrape the dough out of the mixing bowl a dough scraper is the best tool. When you need to cut up the dough into the correct sizes for moulding into loaves a dough cutter is used. This is used to cut the top of the dough just before placing in the oven. The main purpose of the cuts are to relieve the pressure of the rising dough, giving a controlled pattern on the loaf. If you don’t then the crust will naturally split apart at the weakest points. This is fine if that is the style you want as long as you choose it. To place the moulded loaf onto the oven stone you need a peel. 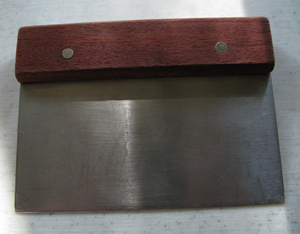 This is just a thin slab of wood with a handle cut at one end and it must be wide enough for the oven and/or bread. . This helps to retain the shape of the bread and prevents you from burning your hands. 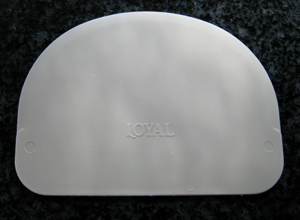 The peel can also be used to remove the loaf once baked, although for a domestic oven using oven mitts will suffice as the oven is not that deep. This makes light work of all of the flour scooping.